Ever hear of an axolotl? Honestly I hadn't, and the first thing I pictured was a JRPG monster/summon/weapon. So quick backstory: this year I've been participating in a program called Kizuna Across Cultures (KAC), which runs an online cultural exchange between pairs of schools in the US and Japan. Using a Facebook-like academic website, KAC volunteers coordinate and act as facilitators of sorts between the schools. I've been volunteering as a "Senpai" (先輩), who are bilingual mentors whose job is to encourage conversation among the students and provide some guidance and support. Not only is it great to stay connected to (language) education post-JET and watch the students learning from one another, but it's also giving me the opportunity to learn some new things. 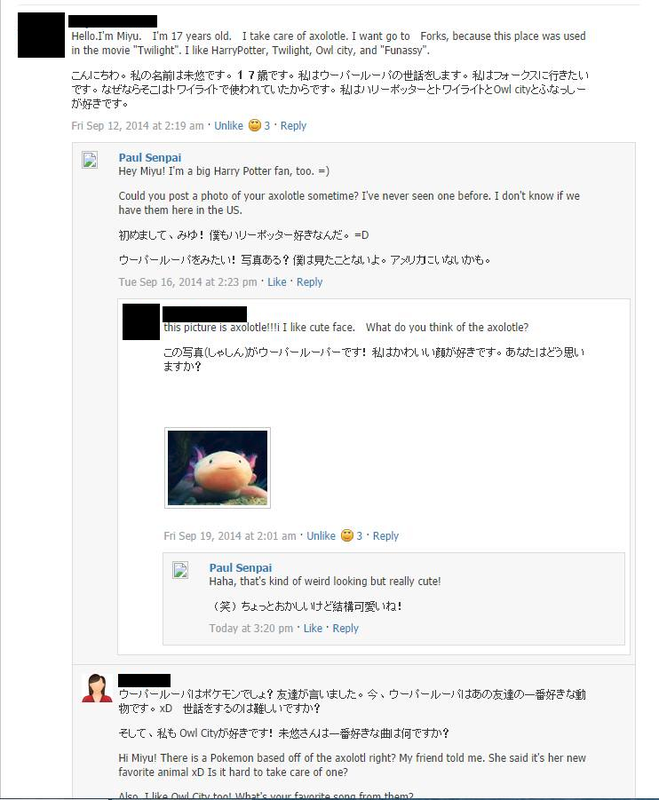 We've just been wrapping up the students' self introductions, and one Japanese girl shared some information and photo of her pet with us. This creature, which in JRPG terms would probably be a low level chump you encounter around the same time as green slimes, is called an axolotl. In Japanese, it's commonly called 「ウーパールーパ」, which sounds a little too much like "Oompa loompa" for my liking. I find it interesting that I had never heard of these things, even though they come from our neighbor, Mexico, but apparently they're a thing in Japan. Is it just me, perhaps, who is woefully ignorant of the Mexican fauna? At any rate I got a nice kick out of this little interaction.